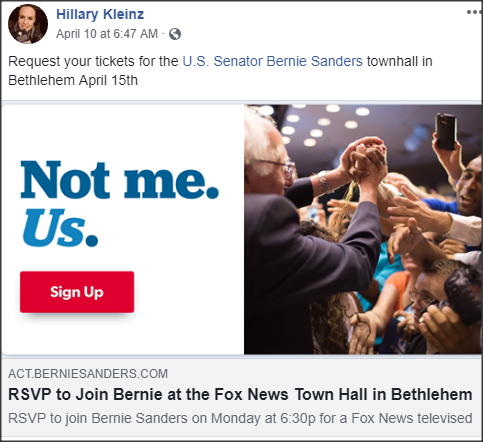 BETHLEHEM, Pa — Bernie Sanders entered the Fox's den on Monday night — and he not only survived the hour-long encounter, but often dominated. That still doesn't explain his $700 coat, expensive house's , and lavish travels around the world. Oh man I was about to go off! I was just echoing some of the things I've heard here. He bombed they hated him. Bernie was terrific! I couldn't believe how much the crowd was cheering. I think the CNN town halls on the 22nd will be more contentious. Yes, Politco, liberals despise Fox as much as truth, love and grace. Fox watchers are completely brainwashed. So, since Sanders looked good, do we now believe that FOX is NOT a right-wing propaganda outlet? No one, including Bernie is selling your premise. Find a single post in which I stated that FOX News wasn't a right wing propaganda outlet. Of course. He's the magical independent, doncha know? I don't know about "triumphant", but certainly useful for Fox and followers. -nt. to say about Bernie's outstanding performance. Would be shocking actually. 5. That still doesn't explain his $700 coat, expensive house's , and lavish travels around the world. FDR would never have passed the New Deal if he went around flaunting his wealth in the manner that Sander does. 10. Please tell me this is sarcasm. Do you know how wealthy FDR was? What mattered were his POLICIES and the WORK that he did on behalf of the American people. I've read some posts (not of yours, bahrbearian) here at DU that had me double-checking. 30. Oh man I was about to go off! Thank God some of the silly stuff around here is just sarcasm. I admit I wasn't sure at first. rwsanders This message was self-deleted by its author. 15. I was just echoing some of the things I've heard here. 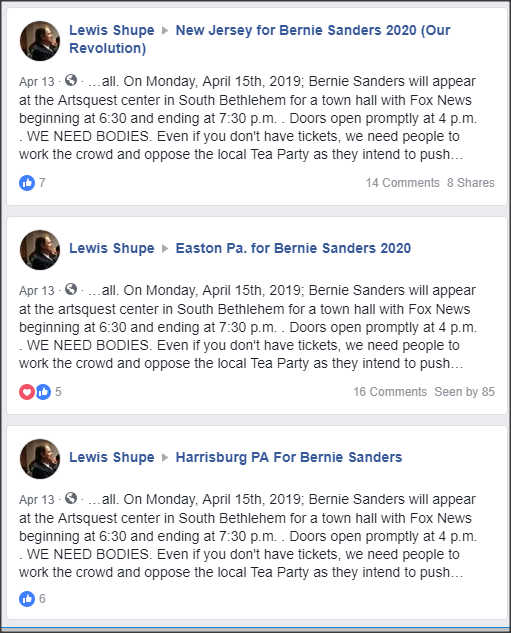 You read some pretty crazy posts trashing Bernie here. I thought I'd get in on the fun. Bill Clinton had $500 haircuts. Find another theme here. The Democratic Party has greatly benefitted from the ideas in the Sanders platform. He is valuable for his ideas. End of story. pangaia This message was self-deleted by its author. ...scooped me on my own daughter's article! 25. "The Democratic front-runner ventured"
Did he get keys to the Fox news studio? Did Fox personalities bow down and say they will never support Trump ever again? 7. He bombed they hated him. 9. Bernie was terrific! I couldn't believe how much the crowd was cheering. I bet Faux News didn't expect that. Really encouraging for the General Election. I'm glad he walked into the lion's den. He slayed! 12. I think the CNN town halls on the 22nd will be more contentious. Bernie and Amy drew the short straws. And got Chris Cuomo. 21. Yes, Politco, liberals despise Fox as much as truth, love and grace. Go Bernie! I knew he would be great! but everyone knows he's a liar and always wrong and might as well be working for putin....."
take on FOX news and come out triumphant. need to go on Fox News. You're not going to change minds if you don't offer an alternative. There's a lot of people that watch Fox, it's time they start seeing other views etc. 44. Fox watchers are completely brainwashed. Do you know any of them personally? They’re full of hate and fear. There is no way any of them will vote for a Democrat. They’re probably giving positive feedback to Bernie because they don’t think he can win against Trump. I remember when some of them said in 2016 that they liked Bernie but couldn’t stand Hillary. They would never have voted for Bernie; they just wanted to appear open-minded. Most are brainwashed, but not all. If we don't go on Fox News and offer alternatives, the situation will just get worse. Once we give up, we lose. Remember when Howard Dean introduced his 50 state strategy? He received the same criticism of "Why even bother, they will never vote Democrat." They were wrong. Maybe Bill Maher has a point, get our message out to the News Corp's victims of psychological conditioning. What's the downside of trying ? Even if only 5% gain some enlightenment, or start asking their party the hard questions, it's a win, no ? 35. So, since Sanders looked good, do we now believe that FOX is NOT a right-wing propaganda outlet? Are we really buying this? Seriously? 36. No one, including Bernie is selling your premise. 42. Find a single post in which I stated that FOX News wasn't a right wing propaganda outlet. 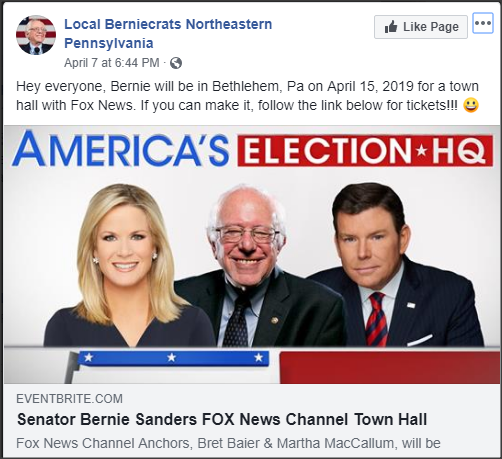 aired a show promoting a socialist democrat, or you don't, and the only way to accept the Sanders town hall as genuine is to conclude that FOX is NOT right wing propaganda outlet. bursting FOX News' bubble, if only for an hour in a state won by Trump, all but dominating the debate with Bret Baier and Martha MacCallum bringing the studio audience into agreement in switching from employer and private based "health" insurance to Medicare for All while speaking live time to 2.5 million Americans (whether you like them or not) Republican, Democrat and Independent with even millions more to viewing it after the event. There is no doubt of the impact and other Democratic Candidates are following suit. Words matter, choose them wisely. 40. Of course. He's the magical independent, doncha know? the Democratic Party muckety-mucks better be listening and learning. 39. I don't know about "triumphant", but certainly useful for Fox and followers. -nt. I hate Fox News (of course... had to include this to head off the posts that say, “Ohhhh... so we like Fox News now, do we?” No. Still hate it. But I did throughly enjoy Bernie mopping the floor with the hosts.). Bernie performed so well that it made me giddy. And I’ve never been giddy for Bernie. Bernie is in my top four now. I said it. On edit - Bernie people surly about Pete: please be kind. Mayor Pete is an important cultural happening. Peace out. Such meaningless hyperbole trying to characterize it as an "American Gladiators" matchup.